Due to the rain, there will be no practice today Wednesday, March 6th. Wave Runners 2019 Track Season is scheduled to begin February 6th, 2019 and will run until May 22nd. Practices are held at Parras Middle School two days a week on Monday and Wednesday from 3:15 until 4:30. Students can attend any number of practices. 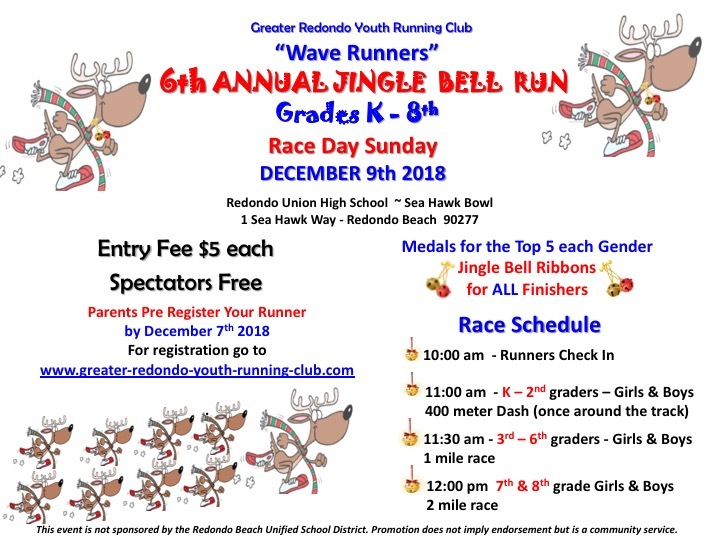 Thank you for joining us for our 6th Annual Jingle Bell Run! Wave Runners- It’s hard to believe how fast this season is flying by! Click on the links below for the rest of the seasons information & updates. Click RACE SIGN UP to sign up for the meets you will be attending. Registration May 5th: 8:00 am – First race at 10:00 am. Registration May 6th: 12 Noon – First race at 1pm. Hey Wave Runners we thought the rain was going to wait until after our practice but it has changed it’s mind. Practice is CANCELLED TODAY see everyone next week!